Buying a scanner or all-in-one (AIO) printer with scanning function, but it doesn’t come with any optical character recognition (ORC) software program to translate scanned or original images and pictures of handwritten, typewritten or printed text into editable text or document? There is no need to spend money to buy expensive commercial OCR programs such as OmniPage from Nuance Communications. There is in fact a free OCR software available for download. 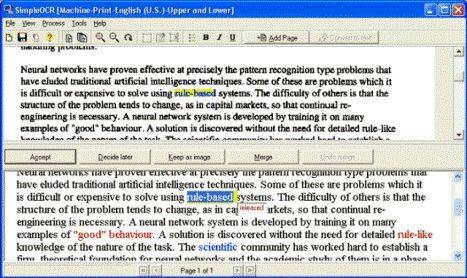 SimpleOCR is a freeware OCR document scanning software that allows users with scanner or AIO printer to scan the document and automatically get the content typed out in editable format. SimpleOCR can accurately reads, converts and translates documents and files with standard fonts into editable electronic format, avoiding the hassle to retype the hard copy documents again. The scanned results can then be imported and used in any application including OpenOffice, WordPerfect and Microsoft Office applications. Beside, as with any other OCR programs, SimpleOCR not only converts black and while or grayscale scans from paper documents, it can also translates black and white or grayscale TIFF images with text too. SimpleOCR also features huge dictionary, despeckle or ‘noisy document’ option, format retention, image retention, plain text extraction, simplified error correction, batch OCR, zone OCR, and multiple language recognition in English and French. SimpleOCR freeware is 100% free and not limited in any way for anybody – home users, educational institutions, even corporate users.